What takes place in the head and heart of an effective facilitative leader? How do they find the inner resources to draw upon? What is the source of their powerful effect on people and situations? 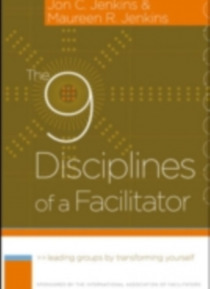 The 9 Disciplines of a Facilitator examines these questions and explores the self-mastery it takes to become a great facilitator. Written by Jon and Maureen Jenkins, two of the long-term members of the I… nternational Association of Facilitators (IAF), this much-needed resource explains that facilitation is more than a process or a set of techniques for managing groups facilitation is its own profession with its own set of disciplines that help define the facilitator's role. Throughout the book the authors detail the nine personal disciplines of effective facilitators: Detachment, Engagement, Focus, Awareness, Action, Presence, Interior Council, Intentionality, and a Sense of Wonder.